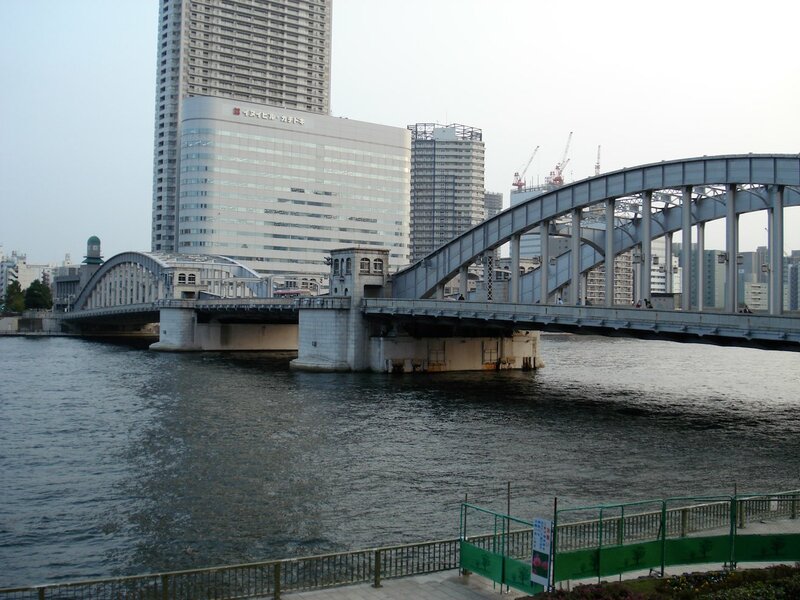 Kachidoki Bridge last lifted its double spans on November 29, 1970. Tokyo residents still have fond memories of the days when it opened daily to let the freighters up the Sumida River. Prior to the building of the modern road system, these boats were the lifeblood of the city. After the road construction took off during the boom years, trucks became a more convenient way to transport goods and the warehouses and docks that once lined up and down the Sumida River declined and disappeared. 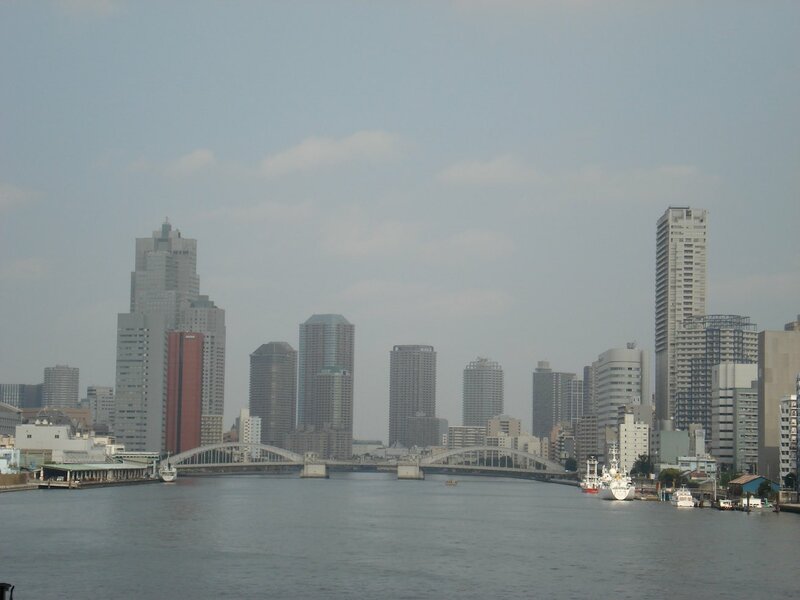 There are 27 bridges that cross the Sumida River in Tokyo and Kachidoki Bridge is the last bridge to cross it before it reaches Tokyo Bay. This 246 meter long and 22 meter wide bridge was opened in 1940 and it was dedicated in celebration of the Japanese Army's victory at battle of Lushun during the Russo-Japanese War. Kachidoki (勝ち鬨) means a shout or cry of victory. The bridge is a double-leaf bascule bridge. This means both sides lifted up and the spans are counter-weighted so that each span easily rotated up. 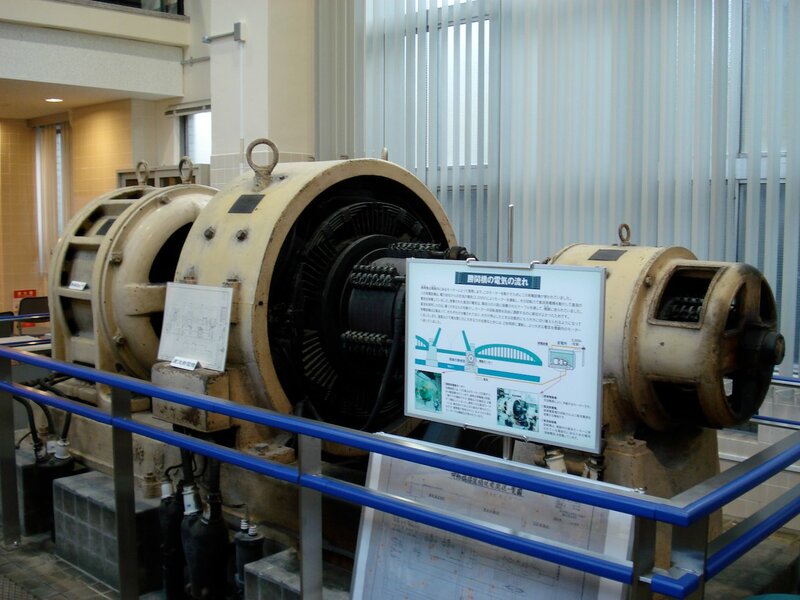 Normally, it was opened by electric motors and one of these is on display in the museum. With the electric motors, it took 70 seconds to open or close the 900 ton spans (and 1,100 ton counterweights) up to the full 70 degrees. From its opening until around 1953, it opened 5 times daily for 20 minutes at a time to let ships pass through. In 1964, it opened only 100 times in the entire year and the last opening for ship traffic occurred in 1967. It was opened once a year until 1970. While there have been a number of recent efforts to open the spans once again for old times sake, they have all failed due to cost and because the road is too busy. Next to the bridge is a small museum filled with the memories of the times when the sound of Kachidoki Bridge's sirens wailing to signal its opening filled Tokyo regularly five times a day. 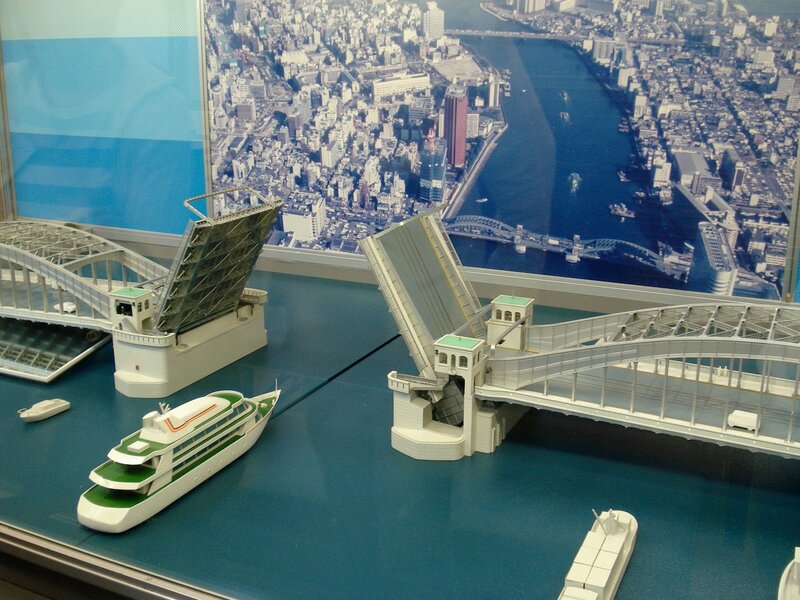 A nice video presentation of the bridge's structure and its operation is the first display inside the door but its recommended that you look at the other displays first. One of the more interesting artifacts is the detailed control room log book on the second floor. Everything from the weather on down was meticulous recorded. 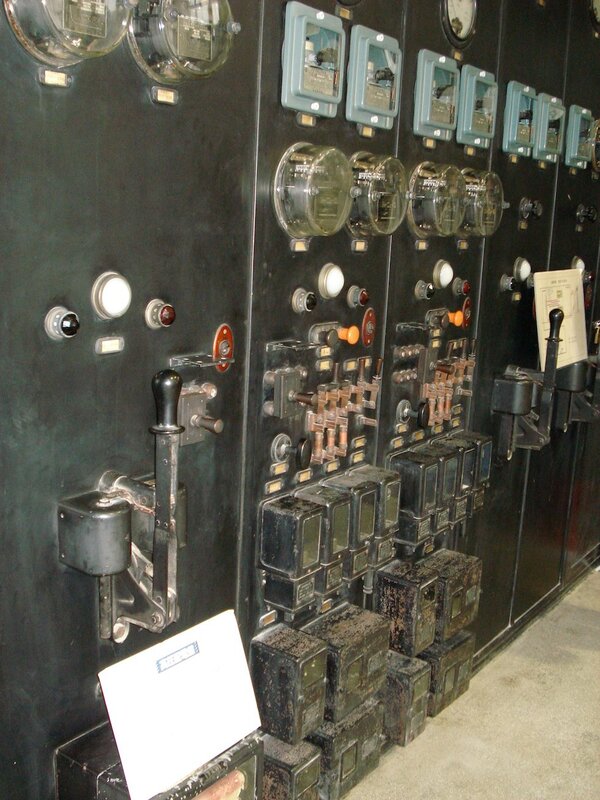 The control panels also on the second floor look like they are straight off of the Frankenstein set. 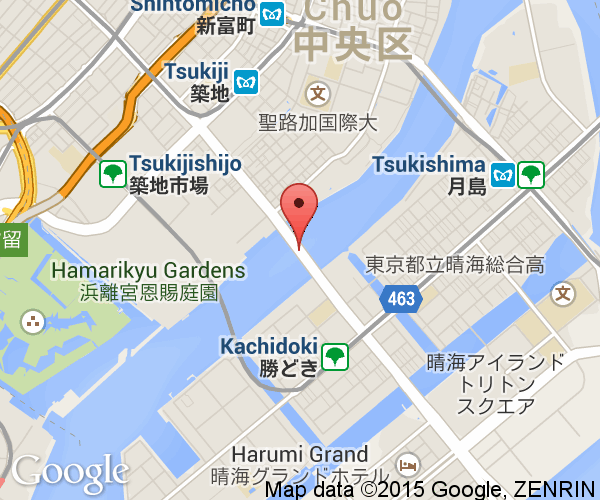 The bridge is a 5 minute walk from Kachidoki Station on the Toei Subway Oedo Line. Tsukishima Station on the Tokyo Metro's Yurakucho Line is a 10 minute walk from the bridge. Kachidoki Bridge is east of Ginza and near Tokyo's famous fish market, Tsukiji.